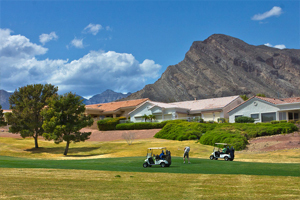 Summerlin Golf Courses, also known as Golf Summerlin are beginning to become more and more popular with giving you a charismatic, challenging and unique golfing experience. Highland Falls is one of three pro golf courses that Golf Summerlin has to offer. This attractive course brings that unique golfing opportunity alive with a specially designed course by both creative and world-class architects Billy Casper and Greg Nash. This is a must play course and you will get not only a completely great golfing experience but an equally great price as well. The golfing opportunity at Highland Falls Golf Club starts from the first tee up moment. 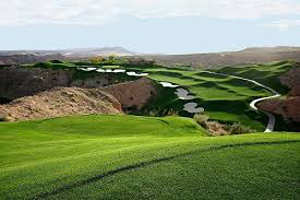 This is considered to be an executive course and there are so many definite complex changes in elevation that you are able to see the city of Las Vegas from every direction or angle. At the 14th hole you have the enjoyment of having a complete view from one end to the other of the amazing Las Vegas Strip! It is an absolute astonishing view and if you play towards twilight hours you will be able to enjoy the magic that the Las Vegas lights will bring to your game. This is a must do and will create a very special, breathtaking golfing moment. The large green becomes very alluring to the eyes of a golfer who really truly loves the sport. Yet it is important to keep in mind that the complexity of the elevation can make it possible for a three putt. So be watchful to the changes in various altitudes, but know that those changes will bring not just fun and fair play, but that the challenge will bring adventure to a normally traditional golf game. Keep in mind that because of how large the green is, just hitting it doesn't guarantee that you get a par. This is a great course! Highland falls not only offers a one of a kind unique golfing experience but because of all the variety of the different elevations the golfer is in for a true challenge. Shots can be made from every angle regardless if it is a side hill, uphill, or even downhill shot. You must be careful when playing though because you will have a water hazard on the 18th which will bring some excitement to the game. Even with the water hazard it is a definite birdie hole and you will get two complete solid shots. This is a true golfing test, but one that a player of any playing degree will enjoy. Highland Falls is 6, 512 yards and although it may seem small, the challenges the player will endure with not just the dramatic elevation changes but because of the well bunkered greens as well, will make this golfing experience not only fun but very rewarding. This also makes for key second shots opportunities. The holes that stand out the most are the back nine, but the calming nature of the course, makes Highland Fall a true gem for a true golfer.